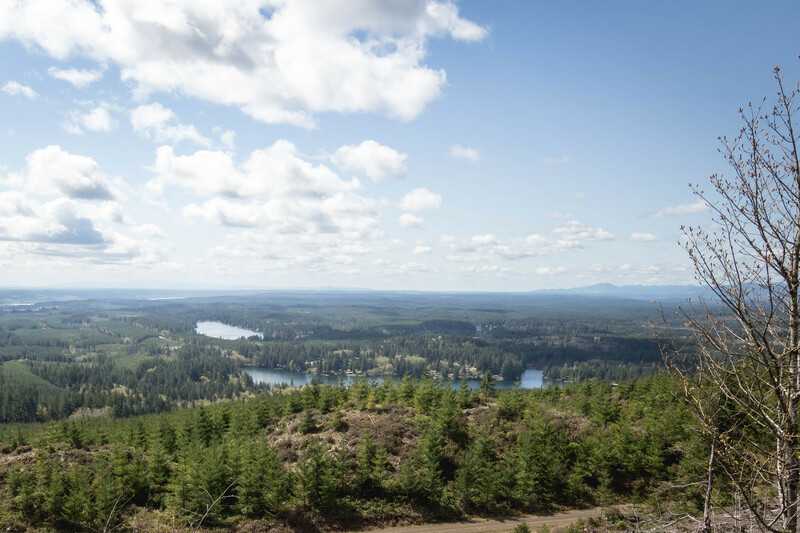 While researching beginner hikes for a friend, I came upon this low-profile, moderate high point on the Kitsap Peninsula. I had also gone up the neighboring Green Mountain 1689, another relatively short and relaxing hike north of here. We first hiked on the heavy foot traffic Gold Creek Trail, but soon realized we were on the wrong trail and turned around. Half a mile back to the parking lot and we found the Tin Mine Trailhead inconspicuously located behind the restroom. 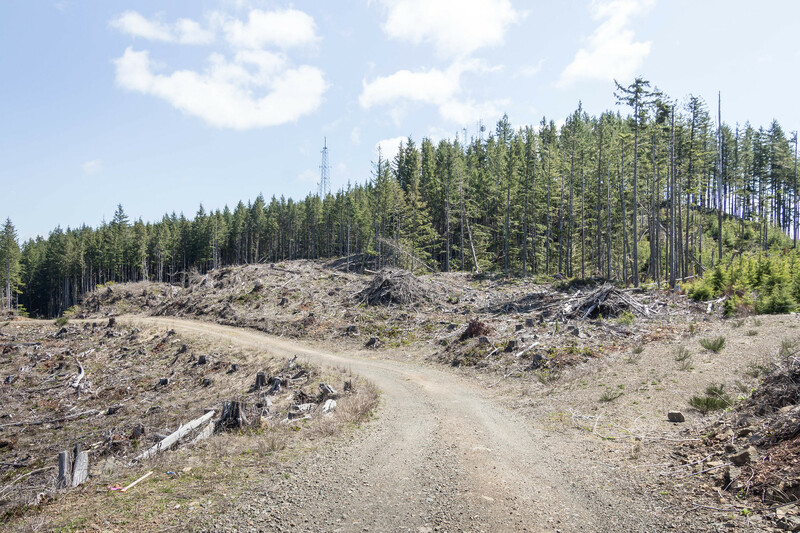 The initially steep trail flattened out in the old growth forest, then it abruptly ended at the 1,200′ clearing. From that point the rest of our hike was spent on the road. Views to the south slowly opened up at the first road junction at 1,250′. The road took a turn due north as we hiked below the first radio tower onto the north side of the ridge crest, where we’d spend majority of our hike time. 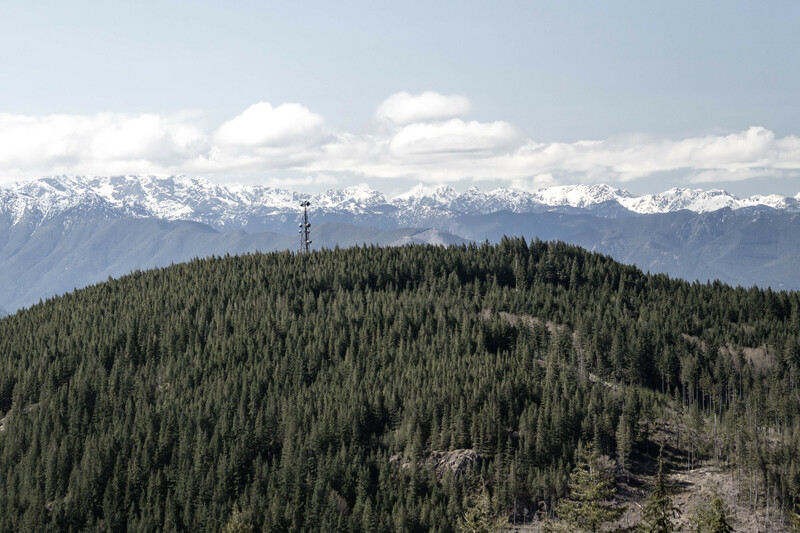 Good views to parts of the Olympic Mountains and the north Sound through several clearings. It wasn’t long before we were on the summit with a radio tower, but it wasn’t the highest point on the summit. After a quick break, we proceeded to hike west a short distance to the adjacent high point with another radio tower. This too wasn’t the highest point, so we backtracked toward the first tower and discovered a faint path leading through brush to the top of a buttress. There we found a USGS marker and a geocache box in a tree stump mentioned in some reports. With absolutely no views, we signed the register, took some photos, and headed back down onto the road. On the way down the mountain, we scoured a couple of spur roads and stumbled upon views of Mount Rainier and downtown Seattle.